Welcome to Fridge Freezers dot com - the new UK website providing information, specifications and prices for all top named brands of fridge freezer in the UK. We're here to help you save money! Why spend more than you need to on new fridge freezers? Use our easy-guide pages to compare prices on all major fridge freezer models and brands. Names including AEG, Electrolux, Beko, Bosch, Candy, Daewoo, Hoover, Hotpoint, Indesit, LG, LEC, Miele, Naiko, Prestige, Proline, Samsung, Servis, Siemans, Smeg, Whirlpool, Zanussi and more. Use our easy to navigate pages to find all the information you need about your perfect new fridge freezer. Upright, American fridge freezers, black, silver, frost free - whatever you desire you will find it here..
With a fridge capacity of 246 litres the new WBC3525NFS fridge freezer from Whirlpool comes with a flat back for easier installation and cleaning. The Whirlpool WBC3525NFS has extra deep door storage with crisper drawer, cooler compartment, reversible doors, bottle rack, egg tray, interior fridge light, 4 door balconies & 4 Shelves including crisper cover. Fridge Freezers dot com offers a free service whereby our website vistors can browse our pages and compare prices at different UK suppliers across a wide range of fridge freezer appliances. These pages include the top UK suppliers of frost free and static fridge freezers including the popular American style models. Simply select the brand name you are looking for e.g. "Samsung" and you will be presented with the most popular models. Moreover once you have a model in mind you can select to compare prices for those particular models of fridge freezers at all major UK suppliers. Whatever you are looking for be it a cheap budget fridge freezer, a premium model, American style or whatever, you are sure to find what you are looking for on these pages. 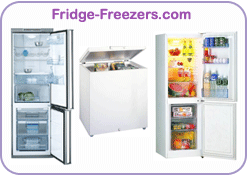 The pages are easy to navigate and designed to help you find the best deal on the fridge freezer you are looking for. Amongst one of the most important features being considered these days is whether or not a fridge freezer is Frost Free. Frost Free - choose a 'Frost Free' fridge freezer and you will never have to worry about defrosting your fridge freezer again. Combination fridge freezer simply means your fridge and freezer storage is provided in one appliance or unit. Look at the split between the fridge and freezer areas and choose the combination that best suits your needs and the type of food you eat. If you shop regularly, prefer fresh produce and only use the freezer compartment for storing things like frozen vegetables, ice cream and ice cubes - go for a larger fridge area - the combination fridge freezers may be the perfect option. The term upright fridge freezer simply relates to the "tall narrow" configuration of upright fridge freezer units that have tended to replace the older more cumbersome "chest fridge freezers". The term "American Style Fridge Freezer" often referred to as American Fridge Freezer, relates to the new very popular upright and very large volume fridge freezers that were originally popular in the USA. These American Style Fridge Freezers are often large upright fridge freezers with two doors running the full length from top to bottom. Many of these models include an ice dispenser on the fridge freezer door so you can dispense ice without opening the fridge or freezer door. Fridge freezers are also available as integrated or semi-integrated fridge freezers. An integrated fridge freezer fits neatly in to your kitchen, with the door covered by a panel that matches your kitchen cupboards. When closed, the integrated fridge freezer is completely hidden and looks like just another kitchen unit. Your kitchen may need to be specially adapted to accept a integrated appliance if it already isn't. Slimline Fridge Freezer appliances are designed for where space is an issue in a kitchen or other storage area. A slimline fridge freezer will be smaller but more thoughtfully designed than a standard fridge freezer with the needs of the user in mind. We have included on these pages all the top named fridge freezer brands available from UK suppliers such as; Comet, Currys, Dixons, Tesco, John Lewis, Asda, Sainsburys, Appliance Direct, Empire Direct, Tribal UK, 24 7 Electrical, Appliance Deals, Boots and many more. Hot picks for washer dryers. Our hot picks of the month are Hotpoint washer dryers. If you are looking to buy any type of electrical goods be it a flatscreen HDTV, fridge freezer, microwave oven, home cinema system or whatever, it is always possible to apply for finance. Whilst we are unable to make any guarantees we would like to recommend the following (unasociated) resources. For a UK unsecured loan, that is a loan that does not require you to use your property as security; find out more here. With the provision of a fast online loan application forms, it is todaymade easy to apply for bad credit consolidation loans. Brokers are at your service 24 hours a day that can assist you in understanding varied aspects that surround particular loans you may prefer to apply for. Looking for a personal unsecured loan where the lenders recommended have access to the majority of UK Lenders. Where you know agents will do all the work for you and only deal with reputable unsecured lenders, mainly owned by major banks. This means that who ever you deal with the agent able to search the market, and compare UK unsecured loans on your behalf, and find the best possible unsecured loan right for you. Even if you have bad credit and want to compare bad credit unsecured loans there are a vast number of lenders who specialise in this. An estimated 1 in 5 people in the UK have bad credit, so you're not alone. This poor credit has brought about an increase in bad credit loan companies and has encouraged lenders to offer a wider range of competitive deals on bad credit secured loans and bad credit unsecured loans. It is generally easier to get a lower rate if you are a homeowner, because you can then get a secured loan but this is now changing with an ever increasing availability of lower rate unsecured loans being available. Again we recommend no fee lenders who deal with bad credit unsecured loans day-in-day-out. So even if you are a UK non home owner, still live at home with your parents, or are a tenant, the options are still almost limitless for this type of UK tenant loan or non-homeowner loan as they are known.